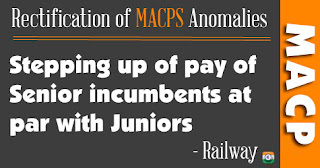 Sub: Rectification of MACPS Anomalies - Stepping up of pay of Senior incumbents at par with Juniors - Case of Railway Accounts Department-reg. "It was explained to the Federation that the 7th CPC have addressed this issue in one of their recommendations. Therefore, we may await for the final outcome on the 7th CPC recommendations. If their recommendation is accepted by the Government, past cases of similar nature may be examined accordingly. The General Secretary/NFIR requested to see that injustice done to the Senior qualified staff is removed duly granting them the benefit of GP 5400/-." Federation has since learnt that case file bearing No. PCV/2016/MACPS1(Pt1) dealing with the above subject has been sent by the Railway Ministry to the DoP&T to obtain NOC and has been pending since long period. 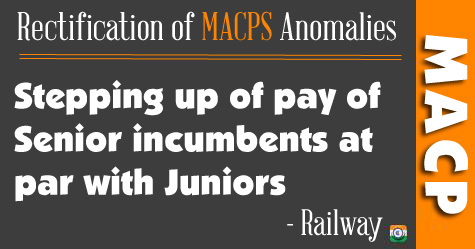 The delay in granting NOC is causing frustration and resentment among the staff of Accounts Department on the Railways. NFIR, therefore, requests the Secretary/DoP&T to kindly see that clearance from DoP&T to implement the recommendation of 7th Central Pay Commission is granted to the Railway Ministry soon. Federation may please be kept advised of the action taken in the matter. Government will soon be able to implement long - term demand for military personnel.